The SMDV Flash Wave III is a wireless system for triggering flashguns and studio lights, as well as for tripping a camera's shutter. 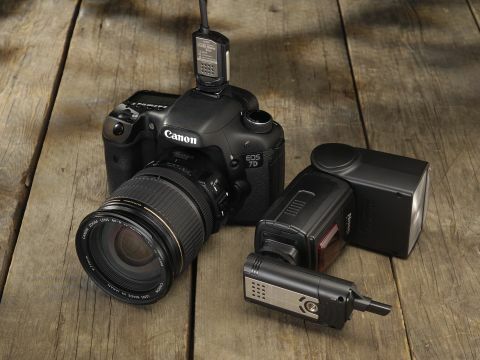 The system comprises a transmitter and receiver: for flash use the former sits on the camera's hotshoe, while the latter either connects to studio lights or accepts a flashgun inside its built-in hotshoe. For remote shooting, the receiver simply plugs into a camera's remote port, leaving you free to operate the transmitter from wherever is necessary. The system supports 16 channels, which are selectable via four small switches on the side of both units; these are painfully small and can only really be moved with the protrusion from the battery cover, as suggested. Both units have LEDs to indicate power and status, although once a flashgun is mounted on the receiver it obscures the power LCD. The models promise a greater range than previous versions, and working on radio frequencies means that they don't require line of sight to communicate. Indeed, the two work just as well through a series of walls and on different floors as they do when right next to each other. The SMDV Flash Wave III's receiver has a hotshoe on one side and a tripod thread on the other, meaning that it can be mounted securely when used in conjunction with a flash. The size of the unit means that it can happily support a flashgun even without a tripod, although on some surfaces it can be easily knocked over - small rubber feet on the opposite side would be welcome for this reason. While the pair work as well as expected, the one thing which may put some off is the lack of TTL metering support. For this, you would need an alternative set up such as some of the more recent PocketWizard models. Still, if you're on a budget and you don't require TTL compatibility, the SMDV Flash Wave III is a perfectly capable choice.